Kooltherm K10 FM soffit board, a bestselling rigid insulation product from Kingspan Insulation will be discontinued on 30 April 2019. This follows the changes made to the National Construction Code (NCC) in the 2016 NCC update, which will be enforced effective 1 May 2019. All stock of Kooltherm K10 FM soffit boards will no longer be compliant with the NCC after the cut-off date, and will consequently be discontinued. The standard introduced in 2016, AS 5637, requires foil faced internal lining materials to be installed on both walls and ceiling when undertaking the full-scale room fire test ISO 9705. This fire test previously required products only to be installed in their intended application (walls or ceiling), but will now require the product to be lined on both walls and ceiling, regardless of their application. Kingspan Insulation has taken the amendment in its stride and released a new product to the market, which is compliant with AS 5637 and holds a Group 2 fire rating. “Kingspan Insulation have been preparing for this transition for some time. We are confident in our ability to supply a product that will not only adhere to the new NCC standard but will also provide the same great thermal performance that our customers have come to expect from us,” commented Kingspan Insulation’s Sales Director, Craig Burr. 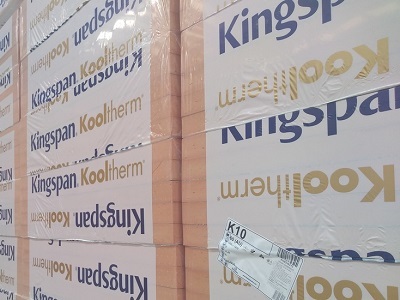 Kingspan Insulation’s new foil faced rigid board insulation named Kooltherm K10 FM G2 soffit board features a thicker foil lining and has already undergone the rigorous ISO 9705 test, achieving a Group 2 rating. “We have been supplying our Kooltherm K10 FM G2 soffit board to the New Zealand market for a few years now and are confident in transitioning the product into Australia. The product is CodeMark-certified for NCC compliance and is ready to be introduced to the market,” continued Burr. A Group 2 fire rating allows the product to be used in most applications excluding fire isolated exits, fire control rooms, and sprinklered public corridors in Class 3 buildings or in Class 9b buildings (other than schools). Kingspan Insulation offers their bonded K10 Plus soffit board for such applications to complete their suite of rigid soffit insulation. “Our Kooltherm range covers a wide range of applications and can be used for a number of solutions. The Kooltherm K10 FM G2 soffit suite is just a small part of what Kingspan Insulation have to offer,” concluded Burr.